―What kind of research do you do, Professor Usami? I do research on legal philosophy in connection with environmental issues. I approach environmental problems and policies from the perspective of justice, with a particular interest in expanding the applicable scope of this ideal. People of the same era share straightforward rules of justice, such as the principle that items borrowed should be returned. But what about those of different generations? Given that future people will be adversely impacted by the environmental degradation we cause today, we can conceive an obligation for the current generation to act with consideration for future generations. On the other hand, what is the reason for obliging the current government to use its citizens’ money on policies for the benefit of people in the distant future long after we ourselves have departed, such as 500 or 1,000 years from now? One of my research interests is to explore environmental problems and policies from the viewpoint of intergenerational justice. I am also interested in the issue of apportionment beyond national borders. For example, the tensions between developed and developing countries over the reduction of CO2 emissions show that climate change is a question of global justice. Climate justice, which is the subject of much research in the international academic community in recent years, thus encompasses the dual facets of intergenerational justice and global justice. ―How do you run your laboratory? Currently there are seven Doctoral students, 11 Master’s students, and four research students in my laboratory. I have six international students from China, two from Indonesia, one from South Korea, one from Switzerland, and one from Bangladesh. We use a mixture of English and Japanese in our seminars. 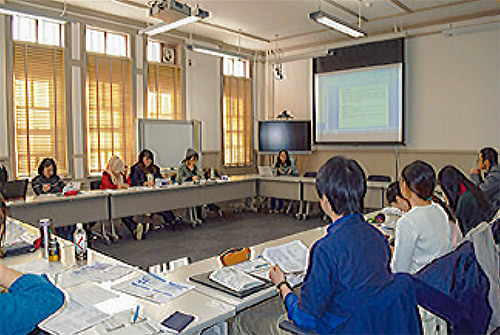 The large number of international students is a feature of the School of Global Environmental Studies, and I think that engaging in discussions and interactions with these students offers great stimulation to our Japanese students, too. There are three pillars to research supervision in my laboratory: (1) individual consultations of approximately one hour each, held periodically; (2) seminars, held on an adhoc basis; (3) joint seminars with other research laboratories in the social sciences, held bi-annually. (2) and (3) involve presentations and discussions among graduate students of many diff erent disciplines and specializations, enabling my students to gain feedback from a variety of angles and delve deeper into their own research. ―Tell us about your graduate studentsʼ research. My current students are engaged in an extremely diverse range of research projects, including psychological exploration of motivations for citizens to purchase green products, inquiry into indigenous people’s attitudes toward the commodification of genetic resource in Indonesia, econometrical analysis of the development of solar panel technology in South Korea, case study of climate change adaptation projects in Africa, legal research on international treaties on radioactive waste, and theoretical analysis of climate justice. ― (Question to Ms. Cita Ekanijati an international student from Indonesia who presented at Professor Usamiʼs laboratory research reporting session on January 26, 2016) Tell us what motivated you to study in Professor Usamiʼs laboratory and about the School of Global Environmental Studies. I study environmental policy under Professor Usami. Both the Professor and the other graduate students provide valuable comments to support my research, and the laboratory also has many books and other materials. In Indonesia, it is not common for students to learn directly from a professor. The access to direct, attentive professorial supervision is one of the great attractions of the School of Global Environmental Studies. The School also has systems that provide students with financial support for projects, internships and participation in international conferences. I hope to become a university faculty member when I return to Indonesia. ―What kind of research do you do, Professor Kajii? I specialize in atmospheric chemistry. My research involves detecting and evaluating atmospheric substances and shedding light on the mechanisms of atmospheric pollution. In the 1970s, atmospheric pollution became a serious social problem in Japan as well. Photochemical smog is caused by substances known as oxidants, which are formed when nitrogen oxides (NOx) found in gas emissions react with volatile organic compounds (VOCs) in the atmosphere. Japan achieved a reduction in oxidants in the 1980s, as a result of factors such as the impact of the Air Pollution Control Act and combined public and private sector efforts to keep the air clean. Since the 1990s, however, oxidants have been increasing once more, and identifying the cause of this increase has become an urgent priority. Oxidant concentrations tend to be higher in spring and lower in summer, meaning that the ongoing increase cannot be attributed simply to long range transport of pollutants such as PM2.5 from China. There is thus a need to detect both oxidants and the VOCs from which PM2.5 particles and oxidants are formed, but it is extremely difficult to identify them given that there are between 500 and 2000 different types of VOC. We have focused our attention on substances known as OH radicals. When they react with VOCs in the atmosphere, OH radicals form stable H2O molecules and dissipate. Measuring the speed of such dissipation yields data corresponding to the overall volume of atmospheric VOCs. In our research lab, we have a hand-made device that uses laser technique to create OH radicals artifi cially and causes them to react with compounds in the atmosphere. Working in partnership with the National Institute for Environmental Studies and other universities, we use this device to measure atmospheric compounds in order to gain our understanding of the chemistry in the air. 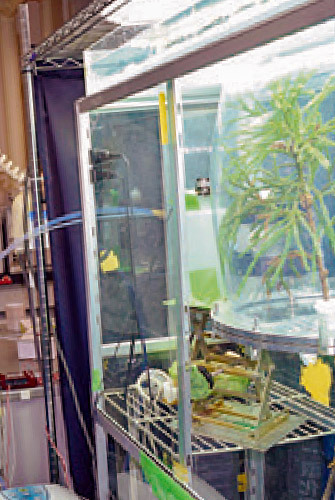 My laboratory currently has two Program-Specific Researchers, one Master’s student, and one Doctoral student in the Graduate School of Human and Environmental Studies, and fi ve Master’s students in the Graduate School of Global Environmental Studies. Each morning at 9:30, Program-Specific Researchers and the Doctoral students gather with my Assistant Professor, Yosuke Sakamoto, for a brief meeting. Once a week, a seminar is held for undergraduate and graduate students, where we report on the progress of our research. Once every half-year, all graduate students make presentations on their research. 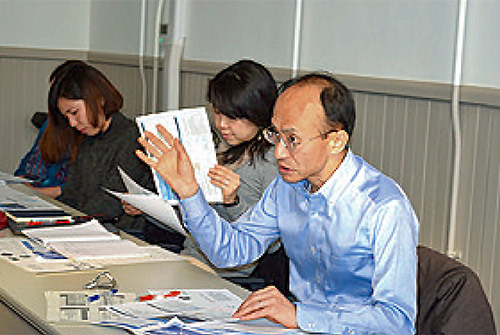 We also hold journal meetings to review the latest academic journals, including a monthly joint journal meeting with the laboratory of Professor Masahito Sugimoto (Aquatic Chemistry, Graduate School of Human and Environmental Studies). There is also a weekly workshop organized by the graduate students themselves, with study activities including thematic summary of books in the field of atmospheric chemistry. ― (Question to the graduate students gathered in the laboratory) Tell us about your research. 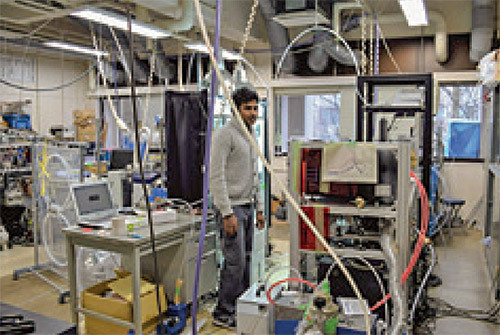 I am studying in Professor Kajii’s laboratory because I want to deepen my interest in atmospheric pollution. I am interested in automobiles, and I do research on exhaust gases. I am researching the mobility of substances in the environment. My motivation was the Kyoto Protocol. CO2 is said to be the cause of global warming, but there may be other factors as well. That is what I am researching. ―Tell us what the atmosphere in the laboratory is like. “Free” might be the best word. We can choose our own research topics freely, and we are allowed to do our research in the manner in which we choose. I was even able to do research overseas, in Vietnam, when writing my Master’s thesis. It was a great learning experience.